Participants arrange their own accommodation. Rica made rooms available for ICCCT2014 participants for NOK 925 per night (single occupancy). To take advantage of this option, please use reference code 17198185 at the time of reservation. The conference rate is available until 28 April 2014 and potentially beyond. 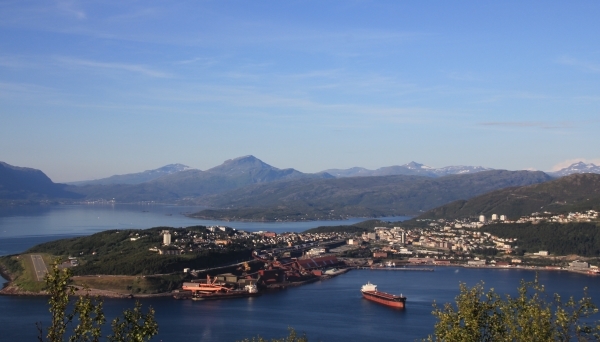 View of Narvik. Photo courtesy Ingeborg Sandvik. From Destination Narvik: Narvik, as the first industrial community in Northern Norway, expanded in synchronisation with the construction of the Ofoten Railway. A town centre was formed and its unique culture was (and still is) influenced by Swedish navvies, British engineers and sailors from across the world. The iron-ore dominates the history of Narvik and in April/May 1940 Narvik became the focus of the world’s attention. The battle of Narvik went on for harsh two months in the spring of 1940 and ended with Narvik beeing occupied for 5 years. Narvik and the surroundings knows an exciting history all the way back rom the early stoneage, and interesting attraction, we wish for you to take part in it. The end of May is probably the most beautiful time of the year. Why not prolong your stay in the Narvik region over the weekend or take the bus out to Lofoten? More inspiration and information can be found at Destination Narvik and Narvik Tourist Info, destinationnarvik.com. Lofoten tourist info can be found at lofoten.info.